Father’s Day is just around the corner, and that’s a pretty big deal for us over here at Dads Drinking Bourbon. Well that being said, there’s not much better ways to celebrate such a great day than some good food to eat with your bourbon. The folks over at Rebel Yell came to the rescue and shared with us some food and drink recipes to help. Although we didn’t receive anything from them from this post, we sure appreciated the great recipes to share with all of you. 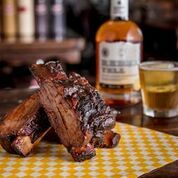 Chefs Mike Johnson and Christina Fitzgerald, co-owners of the award-winning Sugarfire Smokehouse in St. Louis (Mike’s appeared on Food Network and Destination America), curated a special BBQ menu featuring Rebel Yell Bourbon that is sure to leave your mouth watering for more. Chef Mike has been featured on Food Network’s “Beat Bobby Flay!” and “BBQ, Brews and ‘Que,” and Destination America’s “BBG Pitmasters.” He placed first in the 2015 Memphis in May World Championship (seafood), third in the 2015 World Food Championship (bacon), and third in the 2014 Memphis in May World Championship (poultry). Sugarfire Smokehouse has consistently been ranked best barbeque in St. Louis and now has six locations in the area. Combine stock, vinegar, Rebel Yell Bourbon, Worcestershire, brown sugar, jalapeño juice, corn syrup, peach puree, ketchup and tomato paste in a medium stock pot on low heat. Season ribs well on all sides. Lightly dust each short rib with flour, knocking off any access. Heat a large pan on high. Add vegetable oil to pan and sear ribs for 6 minutes on all sides. Remove ribs and place in a roasting dish. Using the same pan on medium high heat, sauté vegetables until softened. Add vegetables, bay leaves, garlic and enough of the sauce to cover 2/3 of the ribs. Wrap ribs tightly with aluminum foil and place on a center rack in the oven. Continue to reduce remaining sauce until desired thickness, stirring occasionally. Roast ribs covered for 3 hours. Allow to rest and serve with sauce. Muddle Rebel Yell Bourbon, sugar and bitters in glass. Add bourbon and ice, and stir. Garnish with lemon peel and/or a sprinkle of smoked maple sea salt. Combine all ingredients, including sage, in a shaker filled with ice, and shake. Strain into a chilled cocktail glass. Garnish with more sage. also use honey instead of sage. Blend Rebel Yell Bourbon, ice cream, caramel drizzle and crumbled bacon. Garnish with whipped cream, more caramel drizzle, and a slice of peppered bacon. For the kiddos, replace the bourbon with milk in the above recipe.